I was reading Fearless Fourteen by Janet Evanovich, and I realized that one reason she's so popular with her readers is that she knows what's fun and spins it out to an enjoyable length. She doesn't just allude to it-- she exploits it. I'm at Seekerville talking about adding conflict in every line. Camy here! I wanted to talk about conflict today, because we all could use more conflict in our lives, right? Especially now that it’s December and Christmas is around the corner? Anyway, one of the best things I picked up from a Donald Maass seminar was his injunction to add tension to every sentence on the page. Chime in and add your own before and after writing! If the climax of a novel seems off, here are a few common weaknesses that can be fixed. Sometimes a writer’s critique partners or first readers will comment that they didn’t like the ending of a story, or that the novel didn’t resolve well. While critique is always good, a vague “I didn’t like the ending” isn’t helpful for fixing it. However, there are a few mistakes often made but easily fixed to create a stronger climax. Make sure you have taken away all other options for the character. If the character reaches the climax but still has several ways out, or a reason to not keep fighting toward the climax, it makes the character look silly or stupid. There are four steps that can heighten tension and reader interest in the climax of a story. The Beginning of the End is often used to refer to the climax of the story, or roughly the last 25% of the novel (in terms of word count or page count). After building the tension and conflict of the middle of your novel, now you want a strong ending that will grip the reader, then provide resolution and release of tension. It heightens the emotional effect of the climax to bring the character’s principle into the mix. Tying principle with external situations gives life meaning for the character, which can help heighten emotional and psychological resonance between the reader and the character. This is one way a writer can manipulate the reader’s feelings through fiction. Camy here: I'm especially pleased to post this excerpt because I'm in this book, too! I have a piece on finding and developing your writer's voice, that elusive "something" in your writing that makes the piece uniquely yours. I hope you guys enjoy this excerpt enough that you'll buy the book! All proceeds from this book go to charity. Simplifying the plot by tying up subplot threads can make the climax more emotionally heightened. Subplots are wonderful things. They can help the reader better understand the characters by showing them in various situations and how they react. Subplots can also complicate a plot and help it take its meandering way to the climax. But there is also one trick many novelists use to make the climax of the novel more emotionally intense, and that is to tie up subplot threads beforehand. Take advantage of subplots that enhance and complicate the plot. It makes for more interesting reading and your reader won’t be able to put the book down. Are you committing any of these query faux pas? Writing even a little every day is a really good way to keep your creativity flowing and to keep your productivity up. I have always liked writing prompts because they can be just a short short story or they can turn into an entire novel! I have noticed a sort of interesting attitude in some submitters. It's that the trick is "getting away with it". You know, say I point out that a four-page long prologue all in italics (because, I guess, it takes place in the villain's head) might be kind of annoying. (I'm making this particular issue up, as the attitude is the important thing.) And the submitter comes back with (rule #1-- don't argue when you're being rejected... it doesn't help), "But (insert bestselling author's name) got away with it!" Click here for part nine. After you’ve worked on that first page to set up the story, showcase your writer’s voice, and wow the editor reading it, give it to your most detail-oriented critique partners or a freelance editor (like moi—sorry, I couldn’t resist some blatant self-promotion) to correct any typos, grammar errors, or punctuation errors. You do NOT want your first page to have an error on it. Nothing spells “unprofessional” like an error on the very first page. The editor or agent will see that one little error and it will negatively tinge his/her impression of the entire manuscript and of your writing. You don’t want even a slightly negative thought to enter the editor’s mind as he reads. You don’t want even a question of your professionalism to niggle at the agent’s brain as she scans that first page. Build the story toward the climax by ramping up conflict in scenes. Novels are a series of peaks and valleys, the ebb and flow of tension. If the story were all tension, it would tire the reader out. If the story were all tension-less, it would be boring. A novelist should build the tension of the story in each peak and balance that with a valley. But each peak should build to a higher point of tension than the one before. Sometimes, a story will have several separate scenes, but each scene’s tension level is the same. The addition of obstacles will make the scene worse and worse, ramping up the tension rather than having separate scenes of the same tension level. thanks for this opportunity. You are one of my favorite writing teachers. Your last article on showing versus telling raised a question for me. When is it okay to break the rules? Not just for telling, but for say, using an unusual tag in dialogue. "Come here," he said. versus "Come here," he demanded. (I realize beats are the most effective. ie He stomped his foot and clapped his hands at the dog. "Come here! ")Anyway, can we sometimes use an unusual tag? Camy here: You can break the rules whenever you want to! Seriously. It’s YOUR story. I usually suggest to writers to stick with the “rules” as much as they can, but if a particular sentence or piece of writing just “feels” better with the rules broken, then try it! A writer can inject unexpected disaster into an uninspiring scene to take it from boring to brilliant. Many times, writers themselves know when a scene is lacking. They may have structured it well, conveyed just the right amount of information, and revealed wonderful characterization via clever dialogue. Yet they'll read the scene they've written and know something is off. While the solution isn't always lack of conflict, many times adding a specific type of conflict can lift a drab scene to one with sparkle. A well-structured scene can still be boring if there's not enough conflict, or if the conflict is too predictable. Dwight Swain is the first writing teacher to publish about Scene and Sequel. In a Scene, the character has a scene goal and obstacles against that goal. Are your obstacles unique? Or are they predictable? Make the middle of the novel ramp up the tension and conflict and set the reader up for the exciting climax. Many times, a sagging middle could be because the tension is not increasing, but remaining the same. There are several things to keep in mind to help the middle build tension and drag the reader along for the ride. As you introduce more change and complications to the character, make sure that it all works to thwart the character from his external goal. Each obstacle should make it harder and harder for him to reach his goal, making his situation worse and worse. This increase in trouble will increase the tension of the story, and increase reader interest. Somewhere in a judges' comment or a 'how to' book I grasped an idea that I thought would improve my work. meaning to me that when something happens or someone speaks, our character has a reaction that prompts an emotion and then they speak. (This done with the idea that these 'things' are part of the conflict). Problem is, that by doing this, I now have been told that I'm burying my dialogue, because some have been at the end of a sentence or two of 'reaction and emotion'. However, popping that dialogue to the front of the paragraph doesn't seem to make sense. I feel like I latch on to these rules, thinking I'm doing the right thing and then . . .
Let me suggest a slight tweaking of that "reaction, emotion, dialogue" tool. Here are three questions to ask when a particular scene seems stalled. Whether you believe in "writer's block" or not, there are always times when a writer gets stuck on a particular scene. It can almost feel like hitting your head against a brick wall. Many times, the writer's unconscious instinctively recognizes when there's something wrong with the scene. While not all scenes have the same problems, there are three questions a writer can ask himself that might help jump-start the writing flow. What Is the Character's Scene Goal? The character should walk into the scene hoping to accomplish something by the end of the scene. This is his Scene Goal. He may or may not achieve it—in fact, more often than not, he doesn't succeed—but he has this purpose in mind at the start. Here are a few principles to help a writer avoid a stagnant or slow-paced middle section of a novel. The focus of the middle of the novel is to push your character to the climax. If writers can keep that point in mind, it will help them craft the events of the middle section to be more driven and purposeful. Here are a few principles to write by. Obstacles force the character to adjust his plans toward his external goal. Faced with each obstacle, the character has to decide what to do next. He makes adjustments, still with that external goal in sight. Then, another obstacle. More adjustment, more decisions. More striving toward his external goal, but via a different path. There are three aspects of a character's actions and decisions that can weaken the first chapters of an otherwise good story. There are many ways to start a story, and no "right" or "wrong" way. However, there are a few principles to follow that can help strengthen a novel's beginning. Here are three character traits that a writer should avoid in the first chapters. The Character Doesn't Decide to Fight. The phrase, coined by Dwight Swain, means that the character doesn't make that Decision which starts the story. 1) the character seems passive, which makes him unsympathetic to the reader. 2) the beginning seems to drag, which might lose reader interest. 3) the reader has no reason commit to the story if the character isn't committed himself. How much liberty are we allowed in creating a new place in our settings? I have a 3rd book of a series set in a town in California. My opening scene takes place in a park, but I can't find a park in the town that's like the one in my head. Can I make one up entirely or can I use an existing park and "plant" some trees or a place for an outdoor concert? Camy here: It's fiction. The sky's the limit! Create new places with impunity! Now, since you're using a real town, don't call your fictional park the same name as a real park in the town. Make up a name so your readers—if they're familiar with the real California town the book is set in—won't get jarred out of the "fictional dream" of the novel to say, "Hey, that's not in XYZ park. This person didn't do her research!" Start your story in such a way that the reader has to buy the book to keep reading. The beginning of a book is where the writer hooks the reader and reels him in. The opening page makes the reader keep reading, and then the end of the chapter is what gets him to buy the book. While that opening page is key, so is the end of that chapter. A long beginning will sometimes deter a reader browsing in the bookstore because the beginning may be indicative of the entire book. The reader wants to know what the book will be about, what it will be like, and they don't have hours in front of the bookshelf. They will want to know quickly. Therefore, as a writer, start as you mean to go on. I'm over at Routines for Writers today talking about Promotion! And before you click away, I want to stress that it's never too early to think about promotion! Hi there! 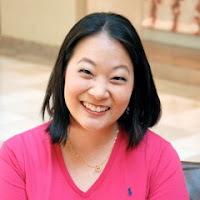 My name is Camy Tang, and I'm thrilled to be guest blogging today! Now, before you look at the title and think it doesn't apply to you, let me tell you—I firmly believe that it's never too early to start promotion, especially if you are a serious writer, seriously pursuing publication. Your book contract might come next week or next year or in a few years, but if you already have your promotion and marketing set up, you're a leg ahead of all the other writers submitting to agents and editors. Yes, they look to see what you already have set up in terms of marketing!